This Wednesday photo provided by the National Park Service shows the remains of what is believed to be an airman whose plane crashed in 1942 on Mount Mendel in eastern Kings Canyon National Park, Calif.
As soon as they were notified that the frozen body of a World War II airman was found in the Sierra Nevada, forensic experts at Hawaii's Joint Prisoner of War Accounting Command began working to solve a 60-year-old mystery. Paul Emanovsky, a forensic anthropologist and a mountain climber, flew to California to join a National Park Service team excavating the body from an isolated mountainside in Kings Canyon National Park. The body was chipped from the 13,710-foot Mount Mendel on Wednesday and flown to the Fresno County coroner's office, still encased in hundreds of pounds of ice. After the body is released by the coroner, it will probably be flown to the JPAC Central Identification Lab at Hickam Air Force Base early next week. Little is known about the man, who was still wearing his Army-issued parachute and sweater when climbers found him Sunday in the Sierra Nevada wilderness, with head and arm jutting out of solid ice. A team of forensic pathologists began melting the ice with cold water Thursday to bring out the body without damage. So far a picture is emerging of a fair-haired man in an Army uniform who suffered broken bones when his aircraft crashed in the wilderness. Forensic experts said soft tissues such as skin and muscle have been well-preserved, as well as the man's sun-bleached hair and his uniform, which identifies him as a World-War II-era serviceman. 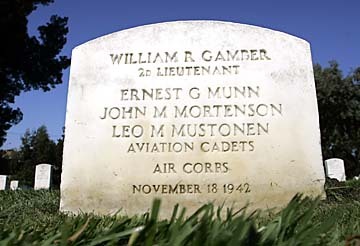 A grave marker for a pilot and three crew members is shown yesterday at the Golden Gate National Cemetery in San Bruno, Calif. The men were never heard from again after leaving a Sacramento military base in 1942 for a routine training flight. No dog tags or other form of identification have been found yet, but most of the body is still frozen, and experts have not been able to search for things like laundry tags or parachute issue numbers. "The identification may not be difficult, but you have to have all the pieces of the puzzle," said Dr. Robert Mann, the deputy scientific director at JPAC. "It's kind of like lifting the lid on a mysterious box, a 60-year-old mystery." Even if a wallet or other forms of ID is found on the body, JPAC will not make a positive identification until it is confirmed through dental records or DNA. World War II dental records can be incomplete, Mann said. And a sample from a female relative is needed to confirm identification through DNA analysis. "The more pieces of the puzzle, the more evidence we have, the more likely the case will be solved," Mann said. JPAC, which has a mission to recover and identify military personnel, has already started searching records of plane crashes and missing servicemen from the area. Relatives of missing soldiers have been calling the Fresno coroner's office from around the country, hoping the man - frozen in his 20s - could be a father or brother who disappeared decades ago. Information from the calls is being passed on to JPAC to be compared with existing records, Mann said. Park officials summoned JPAC because the man was wearing a parachute stenciled with "Army." 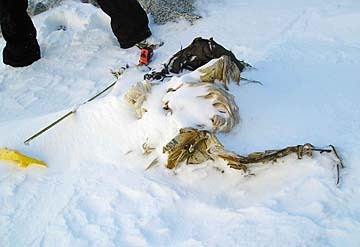 Experts say the body probably went unseen for decades because the isolated mountainside in Kings Canyon National Park does not attract many casual visitors, though it is popular with ice climbers. The area can be reached by hiking two or three days, or by helicopter when the weather allows. Blustery conditions kept even trained high-altitude rescuers from reaching the frozen remains for two days, until Wednesday. Michael Nozel, one of the climbers who spotted the body Sunday, said a fluttering parachute was the first thing that caught his eye. "As I got closer, I started to think, 'Gosh, that doesn't look like a rock sticking out of the glacier,'" Nozel told KFSN-TV. "And then of course, as I got closer, I thought, 'My goodness, I think that is a body.'" Military officials said there are 88,000 Americans still missing from past wars, with most of them, 78,000, from World War II. Only about 35,000 are deemed recoverable. Lost in time: Ice climbers stumbled upon an ice-encased body believed to be a World War II airman who crashed in 1942.
Who was he? Forensics experts say the man was fair-haired and suffered broken bones when his plane went down in the wilderness. What's next? The Hawaii-based Joint POW-MIA Accounting Command, which recovers and identifies missing military personnel, will attempt to identify the man.